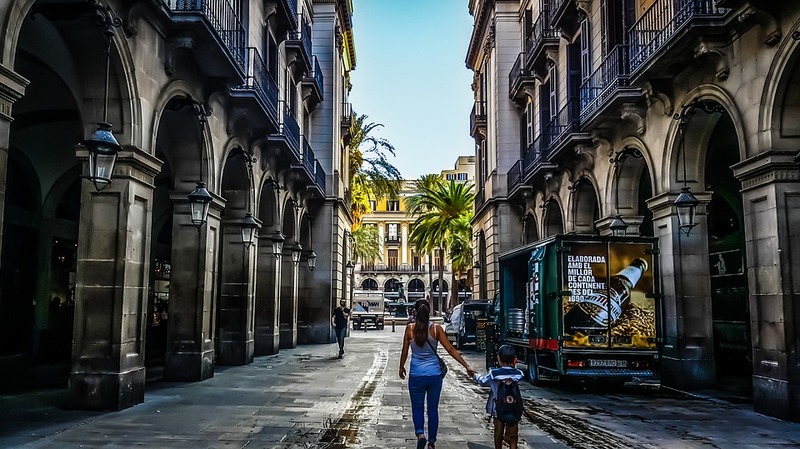 The best way to spend a family holiday in Barcelona is to rent our tourist apartments by the beach in Barcelona or in the city centre, because the latter can become one of the greatest attractions for a family getaway to Barcelona. But there is much more than the beaches, as there are a thousand and one entertainment option for holidays in Barcelona with kids. Here are some of them. For example, did you know that Barcelona has the third oldest amusement park in Europe? Yes, the Tibidabo. A must-visit place for anyone who goes on a holiday in Barcelona with children. Getting there by the Blue Tram and the funicular is already an adventure for the little ones. And if your children are even more intrepid, then you invite them for a ride in the Cable Car of Montjuïc. An air born tour over the heart of Barcelona that will take you from your beachfront apartment to the so-called Muntanya Màgica (Magic Mountain). By the way, there you will also be able to show to your children the historical Poble Espanyol (the Spanish Village), to take a stroll across the total of Hispanic geography without leaving Catalonia. And if the idea of an even more daring family plan tickles your fancy, then take your children to the parc del Forum . There you will find the Bosc Urbà (the Urban Forest) waiting for you. One of the most recent family-friendly attractions in Barcelona, where it is possible to venture into about 50 experiences, such as zip lines and rope ways; neither your children nor you will be disappointed! There are also much calmer fun things to do in Barcelona. How about visiting the CosmoCaixa? Here it is forbidden not to touch and experiment, so it’s an obligation to have fun while discovering a broad range of scientific enigmas. It’s that simple. A real discovery for the little ones. And for you, of course. In fact, there are many museums in Barcelona that organise activities for children. One of them is the Museum of Music or the Natural Sciences Museum, also known as the Museu Blau, which is home to the Botanical Garden where they always have interesting activities for children. During your family holiday in Barcelona, pay a visit to the sweetest museum of all: the Museum of Chocolate, a perfect place for all those who have a sweet tooth. On top of museums, we also suggest a plan with children that will take you inside a work of art. What does it consist of? Going to the Park Güell, one of the most amazing pieces of Gaudí art in Barcelona, together with your family. The adults are invited to admire the enigmatic fantasies from Gaudí’s inspiration, while the children are enjoying every corner of this park to the fullest. The park, as well as many other facilities for children, offers a free entrance for the kids under 6. There is therefore no excuse for not taking your children to one of the most emblematic works of Catalan Modernism. We have recommended the Park Güell or the Botanical Garden, but there are more green areas in Barcelona that deserve a visit. For examples, the oldest gardens in Barcelona. We are talking about the Laberint d’ Horta Park, which was founded in the 18th century and fascinates the children of the 21st century from the very moment they step on its paths. To finish the section about the parks of Barcelona which you may visit with children let’s talk about the Ciutadella Park. Not far from the Gothic Quarter, the port and the beach, this huge green area is ideal for the whole family to escape from the bustle of the metropolis and enjoy a picnic. On top of that, there are waterfalls or a lake where you can rent a boat and go sailing together with your children. Hopefully we’ve managed to convince you that this is one of the things to do in Barcelona with children. And the best news is yet to come: check out the Barcelona Zoo. It is clear to all that the Barcelona Zoo alone deserves a trip to the Catalan capital. This historical zoo not only allows you to see those fantastic animals known to any child, but also offers a variety of activities throughout the year. Such proposals elaborated by the educators of the Barcelona Zoo get animals such as hippopotamus, zebras or elephants much closer to children. Very similar things can be said about the Barcelona Aquarium located in the port. The marine fauna preserved inside of this gigantic aquarium makes it one of the city’s greatest attractions. But the visits here are not only to contemplate; there is always a chance to live a unique experience. Go ask your child if he or she would like to spend a night with sharks. If that idea tickles their fancy, in the Aquarium of Barcelona everything is possible. We have named some of the most popular activities for children in Barcelona. But there are many more. For example, you may check the programming of the Teatre Gaudí or the Jove Teatre Regina, which often give performances for children. Likewise, if the family trip to Barcelona is at the end of spring, it may coincide with the well-known SonarKids festival. Or, why not embark on the popular Golondrinas (touristic boats) that set sail from the port of Barcelona and take your family on a sea voyage for a while. Although if you prefer to take advantage of your holiday in the city to tour the surroundings, your children will for sure enjoy the Naturapark in Cerdanyola del Vallés, the Catalunya in Miniature Park located in Torrelles de Llobregat, or the Granja Aventura Park in Viladecavalls. In short, we hope to have answered some questions about what to do with children in Barcelona. Now all you have to do is to sit down in the living room of the apartment you’ve rented from Lugaris and plan your stay. These tips have been very useful for us. We were looking for ativities during our stay in Barcelona with our two kids and they had a great holiday. Fun in the Aquarium, and even got them interested in science at the Science Museum.